The mad Xmas rush is now over and many of you will have reluctantly dragged yourselves away from the sea and sunshine and be back at work. If you were lucky enough to be here over the holiday season, we hope you had a relaxing and enjoyable break. Your KRRA committee is also back at work, beavering away on your behalf on the many issues and projects that arise in our small community. We hope you enjoy this latest instalment of our community newsletter, and as always, please feel free to let us know your thoughts or views on anything relating to life in Kuaotunu. Our usual January public meeting was exceptionally well-attended this year, with the committee being joined by close to 65 members of the public together with representatives from TCDC. It was fantastic to see so many of you there. The minutes of the meeting have now been drafted (they will be approved at next year's meeting) and you can read them here. The next big event on the KRRA calendar is our AGM which will be held on the 1st of April (Easter Sunday) at 3pm (again at the Hall). Please note that if you are NOT a financial member of KRRA, as our financial year ends on the 31st of March, you will NOT be eligible to vote at the AGM unless you have paid your membership subscription before this date. Find out how to join KRRA and pay your membership fee here. (If you believe that you have in fact paid your membership fee this year, please contact us and let us know when you paid). You are still very welcome to attend the meeting whether you are a member or not! 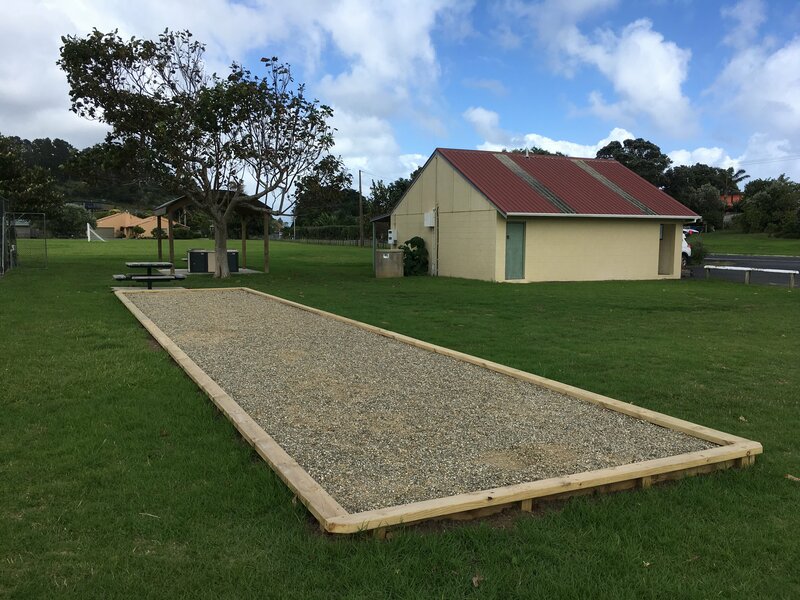 We are delighted to report that a petanque court has now been installed adjacent to the tennis courts at the Domain, courtesy of the Domains Board. With community feedback having been split 50/50 with regards to the preferred location, the announcement that the changing rooms (seen above just beyond the petanque court) will be remodelled to become our new library tipped the decision in favour of the location at the Domain. The piano has been a feature of the Kuaotunu Hall for many years now. However a number of users, especially wedding clients, don’t want the piano in the hall during their event, or want it in a different position, and therefore move it around. This wasn't such an issue with the old floor, but as it is a very heavy piece of furniture, moving it would undoubtedly damage the hall's new floor. The Hall Committee considered having the piano bolted to the floor in one position, but felt this was too restrictive. Given the piano's minimal use (in recent years it has been used for Christmas Carols and perhaps one or two other times each year) the annual cost of tuning it isn’t justified, and no solution has been found to support moving the piano when required without damaging the floor. After long discussions the Committee has therefore regretfully decided that the piano can no longer live in the Hall, and would like it to go to a member of the Kuaotunu community. Originally built as a player piano, the roll mechanism has been removed and it is now a normal upright piano. Its age is not known; it is old and plays like an old piano. It would make a good first piano for a novice. If you are interested in acquiring the piano, please contact the Hall Committee. Campers parking at the Kuaotunu boat ramp are causing problems by taking up boat trailer parking spaces, when at peak times there is clearly not enough parking space already, which creates a traffic hazard on SH25. KRRA has been working with TCDC and NZTA to have signage erected to inform campers that the boat ramp parking area is for boat trailers only. However it has also been suggested that it would be a good idea to find an alternative location in the Kuaotunu area for self-contained campervans, motorhomes and caravans to park. Drivers are legally allowed to stop and sleep on the side of any state highway, so the aim would be to provide a sensible place for this activity and therefore reduce any negative impact. Advantages: Close to beach and toilets, sports field, tennis courts, BBQ and petanque court. Some of this land is currently a road reserve so possibly relatively easy for permitting. Disadvantages: Close to an increasingly popular family area and occupying some of our limited beachside reserves. Advantages: Very close to beach and toilets, Lukes Kitchen, shop and village with a superb outlook! Disadvantages: Would take up some of our limited reserve land that is already used by local family groups for recreation. Also used for local events such as the Bubble festival, the Kuaotunu Kindergarten's Lantern and Spring festivals, etc. Advantages: Land not used by family or community groups and if established could be used to help push TCDC to extend footpath from Waitaia Road to beach. Disadvantages: Some distance from the beach (but much closer than the new Whitianga one on Joan Gaskill Drive is), so would probably require work on SH access before NZTA would agree. Would also probably require some fill to bring it above flood level, but maybe TCDC would be happy to have this space to dump roadworks fill anyway in the meantime, so that may not be a big problem. Land is currently leased for farming. Due to the amount of work required this location would most likely take some time to make operational. KRRA would like to know how Kuaotunu residents and ratepayers feel about this issue. You can give us your opinion here. Interested in Becoming a Kiwi Courier? Do you live in Rotorua or Tauranga, and/or travel reasonably frequently between Kuaotunu and those places? 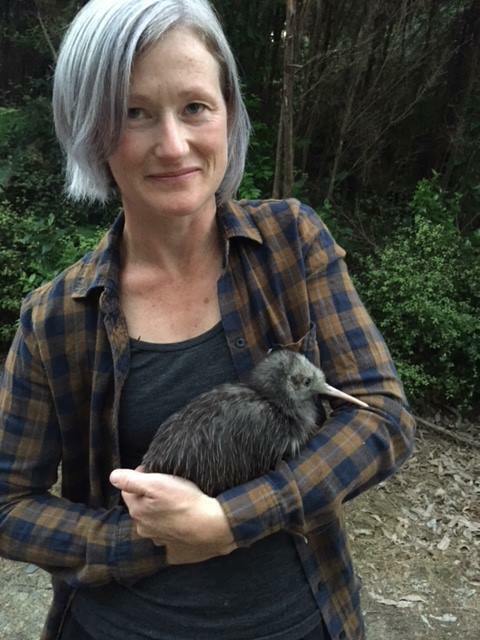 If you think you could spare a seat for some kiwi eggs or chicks occasionally, please text or email Paula Williams of Project Kiwi (021 382 900, hello@projectkiwi.org.nz) - she would be delighted to add you to her list of volunteer couriers. By way of thanks the Trust pays for a free Kiwi Encounter tour if you are going directly to Rotorua. Every trip that can be made by volunteer couriers means more money that is available to improve the outcomes for these precious birds. And if you have children this is an incredibly special opportunity to promote the idea of being an active contributor in conservation. The kauri joists and bearers recovered from the foundations of the Kuaotunu Hall, and the wood from the floor itself, have been in dry storage since their removal from the hall last year. There has been wide interest in the community about what will happen with this resource/treasure; especially, whether some/all can remain within the Kuaotunu community. At the same time, the hall committee is aware that the sale of this valuable timber would contribute towards the funds required for the next large building project at the hall, that being the replacement of the cladding that currently exists on the annex, i.e. the parts not of the original building. The current idea is that a small package of the timber be placed on Trade Me for auction and sale. This will then give the Hall Committee a benchmark price for further sales, whether direct into the local community or further on Trade Me. The Committee would welcome any thoughts and ideas on this process before Wednesday, February 28. You can contact the Committee here, or alternatively please feel free to speak to any committee member directly. It has been pointed out that the final results of the KAMAG survey undertaken in September last year were not published in this newsletter. The results were: 206 valid responses received, 193 (94%) in favour, 13 (6%) against and 30 invalid replies. The Annual Bubble Festival is happening THIS Friday 16th February, 6pm at the Reserve. Bring your family picnic, bubble wands and bubble juice and join in the fun. There will be prizes for the biggest bubble, funniest bubble and the most bubbles in one breath. Did you know that Kuaotunu now has its own Book Club, which meets monthly at the Hall? The next meeting is on Tuesday 20 February, and features a discussion with Lawrence Winkler, author of the newly released novel, The Bolthole. Come and hear this part-time Otama resident read from his latest novel which is set on our very own Kuaotunu peninsula! 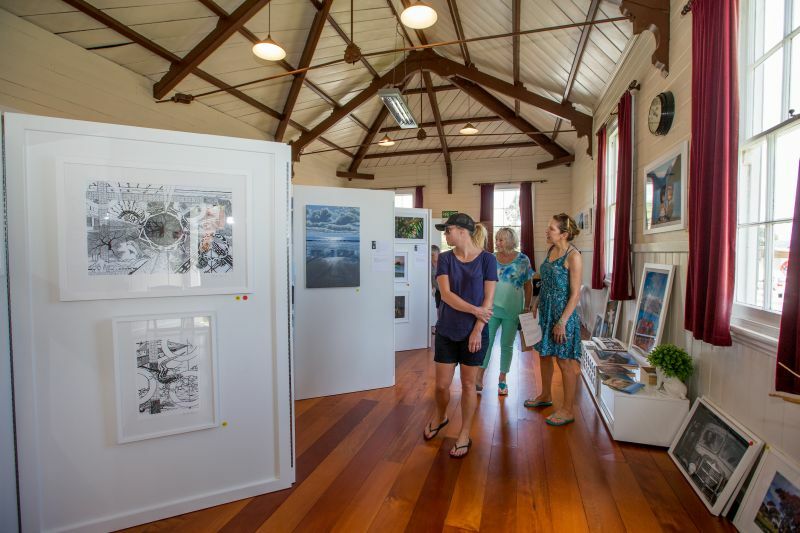 Finally the recent 10 Artists Exhibition, held over Anniversary weekend at the Kuaotunu Hall, was a resounding success with approximately 2,000 people wandering through the hall and admiring the incredible creative talents of our local artists. Not only were visitor numbers high, but sales also - so much so that our artistic community is already planning to hold this event at Labour Weekend each year, as well as Anniversary weekend. A fantastic result!